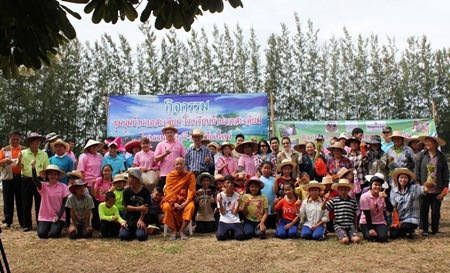 The management and staff of the Shangri-La Hotel Chiang Mai led by the Committee of Corporate Social Responsibility joined the students of Ban Ko Saliam in Buak Khang Sub-district of San Kamphaeng in planting rice and treated them to a special lunch The 60 plus students were joined by Somsit Khamyon, Vice President of BuakKhang Sub District Council, teachers and localS. The school encourages students in sustainable agriculture including raising chickens and fish, and growing vegetables to contribute to school lunches. The hotel organized the day as part of the campaign supporting the sufficiency economy as outlined in HM the King’s speech. Students from the upstream areas of Chiang Mai took part in a youth camp to learn more about watersheds, water sources and natural conservation held by AIS and the Department of National Park, Wildlife and Plant Conservation. AIS joined together with the Department of National Park, Wildlife and Plant Conservation to organize their 5th annual youth camp “We Love Water Sources” to introduce students to the importance of watersheds and water sources. 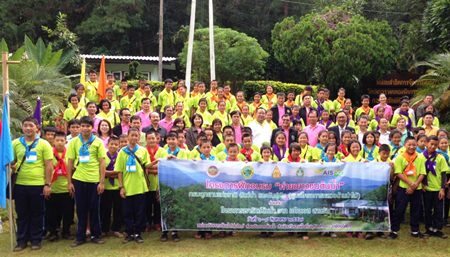 One hundred lower secondary students from schools in the area joined in the Youth Camp to study about the conservation of water sources and the environment in outside the classroom experience at the Watershed Management Unit of Pong Khrai in Mae Rim. Kamolchai Kotcha, Director of Protected Areas Regional Office 16 said that Department of National Park, Wildlife and Plant Conservation works as the primary agency in conservation of forest resources and wildlife, and noted that watersheds are an important factor in preventing natural disasters and at risk in climate change. 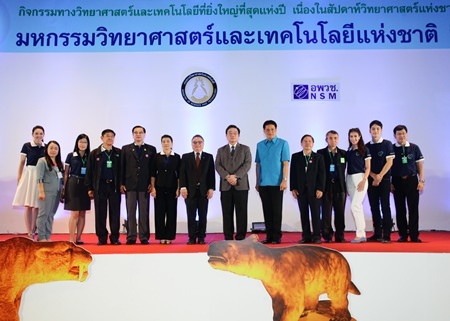 The organization is working to meet the initiatives of Her Majesty Queen Sirikit that everyone participates in the conservation of the forests of Thailand. The department recognizes the importance of maintaining ecological sustainability and so educates children and youth as well as all sectors of society on the importance of forest conservation to reduce the severity of natural disasters. Dulyadej Shinawatra, Assistant Director of the Bureau of Operations of Advanced Info Service PCL (AIS) Northern Regional said that AIS expanded the camp to students from schools in the upstream areas to make them aware of the value of the water they use and campaign to all communities which has water sources and rivers flowing to realize that those rivers provide water to downstream communities. The 9th Science & Technology Fair is being held in Chiang Mai from August 12 to 28, 2014 at the International Convention & Exhibition Center. Admission is free to the event which has booths on black holes, dinosaurs and more. The National Science & Technology Fair 2014 opened at the International Convention and Exhibition Center on August 12, 2014 and will run through to August 28, 2014. The Fair features the best and brightest of Thailand’s science and technology scene and aims to promote science to youth around Thailand. The Permanent Secretary for the Ministry of Science and Technology Assoc. Prof. Dr. Weerapong Pairsuwan was joined by Chiang Mai Deputy Governor Navin Sintusa-ard and Sakorn Chanapaithoon, Vice President and Acting President of National Science Museum of Thailand (NSM) in presiding over the opening ceremony of the Fair. They were joined by presenters Jirayu “Kao” La-Ongmanee and Chalida “Mint” Vijitvongthong. The National Science & Technology Fair 2014 exhibits the latest technologies and scientific discoveries to inspire students and the general public under the theme “Spark ideas for a better life through Science & Technology”. The fair is held to honor to HM King Rama IV (King Chormkao) the Father of Thai Science, and to honor HM King Bhumibol Adulyadej as the father of Thai Technology and the father of Thai innovation. 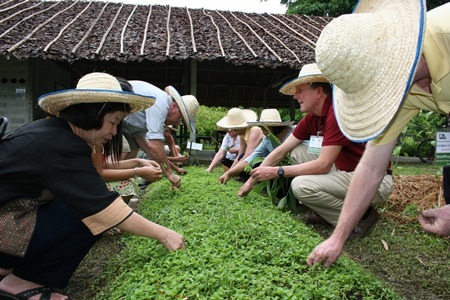 There will also be celebrations as this year has been designation by the United Nations as the “International Year of Crystallography: IYCT” and “International Year of Family Farming: IYFFX”. Sakorn Chanapaitoon, Acting Director of the National Science Museum Thailand (NSM) said that this is the 9t consecutive year the Fair has been held. There are five countries and over 100 agencies are involved. There are booths with multimedia learning experiences on the origin of black holes, the wooly mammoth, a dinosaur skeleton and more.